Posted on 23 September 2013. The fight to oust acting Chief Justice Lombe Chibesakunda from the helm of the Judiciary today sees the Law Association of Zambia file a legal suit before the Lusaka High Court. According to James Banda, the Law Association of Zambia (LAZ) president, the lawyers’ body will seek the court’s determination in Chibesakunda’s continued stay at the helm of the Judiciary on grounds of the acting Chief Justice’s qualification or lack of it to hold the office. “Our litigation committee has finalised the case and made a decision that we sue; so, tomorrow we are filing in court. Basically, it is to do with her being overage. Details will be availed after the said action,” Banda said. Earlier, LAZ had given the Executive a 30-day ultimatum to resolve the matter or the association will commence court action against the acting Chief Justice. The lawsuit comes at the expiry of the ultimatum. Chibesakunda has come under increasing pressure to vacate office with the civil society and opposition parties citing the parliamentary select committee’s refusal to endorse her being nominated Chief Justice and her being overage. Nevertheless, these calls have fallen on deaf ears as those who appointed her; the PF government, have risen to her defence and refused to nominate her replacement. Recently, MMD Copperbelt provincial information and publicity secretary Yotam Mtayachalo said Acting Chief justice Lombe Chibesakunda must resign on moral grounds because the law did not allow her to occupy such an office. 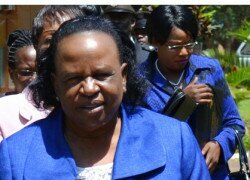 Mtayachalo had said that it was sad that the people who were supposed to know the law were showing arrogance on straight forward issues. He said that it would be fair if Justice Chibesakunda stepped down because she was a lawyer and judge who was expected to guide and protect the law and the Constitution. Mtayachalo held that for Law Association of Zambia (LAZ) to maintain that Justice Chibesakunda was not qualified to hold the office of Chief justice showed that there was something wrong with the process. “LAZ has maintained that Justice Lombe Chibesakunda is not qualified to hold the office of Chief Justice, and I see no reason why she has to continue to be in that office,”he said. He said the arrogance and stubborn attitude shown by the people involved in the matter was certainly not in the best interest of the nation. Mtayachalo said that as long as Justice Chibesakunda remained at the helm of the Judiciary, there would be no justice in the country; add that the integrity of the Judiciary would continue to be injured because of political interference.